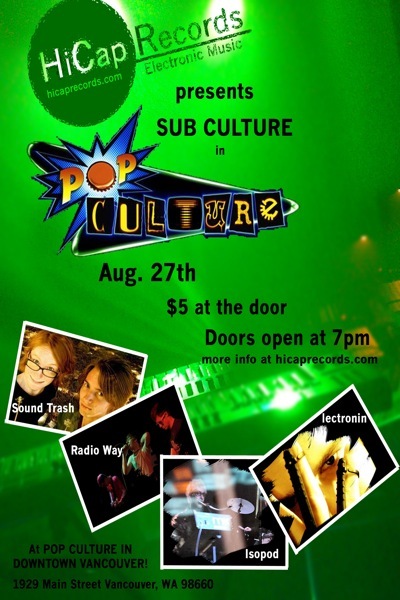 HiCap Records » HiCap Show at Pop Culture Thursday, August 27th! HiCap Show at Pop Culture Thursday, August 27th! HiCap Records is proud to present “Sub Culture in Pop Culture”. It’s going to be an all ages night of electronic mayhem featuring four bands. HiCap artists Radio Way and Lectronin and Isopod (from the 080808 show) and new friends Original Sound Trash from the Satyricon show. It’s going to be a fun night with a light show, dancing, and soda pop. That’s right, Moxies has become Pop Culture complete with a new stage. But they still have the same great selection of soda. So come out Thursday Night, August 27th. The show starts at 7:00 PM and costs $5 at the door.